Source: Bureau of Labor Statistics and the College Board. The figure compares inflation over the last 30 years associated with (1) the general cost of living, (2) the cost of medical care, and (3) college tuition and fees. Inflation factors were computed to answer the question: in each year, how many dollars would be needed to have the same buying power as $1.00 had in 1978? The calculations made use of published data on the Consumer Price Index for all urban consumers (CPI-U), the medical costs component of the CPI, and historical data on inflation of college tuition and fees. As is well known, medical care costs have grown faster than the general cost of living — by 2008, nearly twice as much. This receives a lot of public attention and many complaints. Yet college tuition and fees inflated at a much faster rate: nearly three times that of general inflation. Thus while it took $3.30 in 2008 to buy the same general commodities purchasable for $1.00 in 1978, for college tuition and fees nearly $10 in 2008 was needed to buy what $1.00 got in 1978. This excess inflation has, incidentally, occurred across the board: for both private and public 4-year colleges, and for public 2-year colleges. This is why students are being forced to take out exorbitant loans. After adjusting for inflation, college tuition and fees are roughly three times more expensive now than in 1978. Why? What has intrinsically changed about college education so that this is the case? 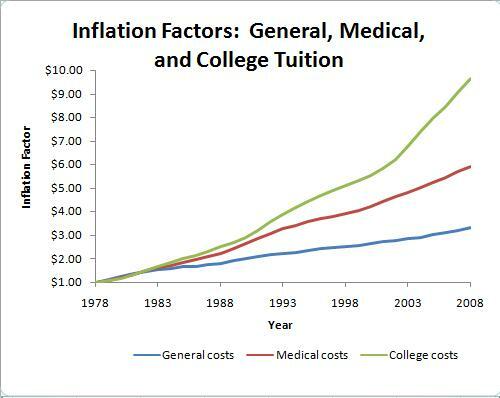 Excess inflation of healthcare costs is a prominent issue and receives much attention; but excess inflation of college costs is even greater. Why is this not a major social issue? Shouldn’t we be making a college education easier to obtain instead of more difficult? We claim to rely on young people to make a better world in the future. How are they supposed to do that when they step into adulthood already burdened with debt? The College Board. Trends in College Pricing. Princeton, NJ: 2008. Ronald Ehrenberg. Tuition Rising: Why College Costs So Much. Harvard University Press, 2002. Paul Streitz. The Great American College Tuition Rip-Off. Oxford Institute Press, 2005. Richard K. Vedder. Going Broke by Degree: Why College Costs Too Much. American Enterprise Institute, 2004. Penelope Wang. Is college still worth the price? Money Magazine. August 20, 2008. The Path Least Taken » Blogger FAIL. I think you need to check the math. The rate of inflation was about 300% from 1978 to 2008 but if it took $10 in 2008 to purchase something that previously cost $1, then that represents a 1000% increase or ten times as much. I don’t understand why more people are not asking their state legislatures about this because, as the article points out, this is creating a situation where the middle class are being squeexed out of college. The rich can handle the increase, the poor qualify for grants but the middle class who earn just enough not to qualify for grants find it impossibly difficult to pay for college. Somehting is grossly amiss in this picture. What this chart doesn’t show is where all the extra money we pay for medical, and tuition costs went. To the top 1%.